This week’s eLearning Heroes Challenge on the Articulate Forums was all about course navigation. And you know what? It’s always a good time to talk about navigation. If you are still creating all your eLearning courses with a strictly linear path, then you’re missing a major opportunity to engage adult learners. I know what you’re thinking: “But it’s a Compliance course, and people just need to get through it as quickly as possible.” Change your mindset. Free yourself and your courseware from the limits of linear thinking. Regardless of the topic, you need to make your learning interesting and engaging for your learners, or they won’t remember your key points a minute longer than the answer to the last quiz question. Sure, sometimes a linear 1-2-3-4-5 etc. progression of slides makes the most sense. But if you’re looking to involve your learners, and encourage them to remember your information, help them invest in the course, even just a little bit. How do we do this? In this simple sample, I give the learner free choice to decide on the order of topics, and use branching to deliver the content, while still ensuring that they complete all the material successfully before moving on through the course. Offering them the opportunity to explore as they please is a small gesture with a large impact. Adult learners like a course better if it gives them at least a little bit of autonomy, the ability to make their own choices. Think about it–do most people really like to be told what to do, or where to go? Even in a Compliance course, where the stakes for demonstrating mastery of the topic can be high, you can still give your learner some choices. You can also entertain and engage your learner while you’re at it. I regularly recommend using a scenario-based approach to learning. Why? Because everyone loves a good story, for one thing. And a good story can offer opportunities for you to involve the learner in creating the outcome you seek. In the example I’m sharing here, I’ve created a very basic template in Storyline 2 that you could use for a Compliance course, or any other type of course. I’ve picked the topic of Information Security, which is a concern for all businesses, regardless of size. I kept the look and feel very neutral and professional. 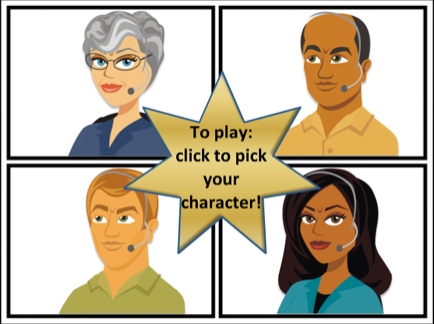 I present a simple menu page that introduces three characters, and invites the learner to click on the characters in whatever order they choose, to explore a risk scenario and help that character avoid making a terrible mistake. So without overdoing it, I’ve introduced a story element, and a little bit of drama to pique the learner’s interest. In my sample, I’ve set up a simple one-slide scenario and one quiz question for each character’s path, but obviously you could do a lot more if needed–although remember that brevity is always a goal. Using characters introduces a human element. Making up a real-world scenario the learner would easily recognize makes that character and situation all the more real. Asking the learner to step in and prevent the character from making a big mistake involves them in affecting the outcome of an event they feel could actually happen in their workplace. Note my word choice there: regardless of the topic, you need to get your learners to feel something if you want them to remember. In this sample, I’ve set up the questions to allow infinite attempts. You could also add meaningful feedback for wrong choices to enrich the experience. What you’re subtly doing is making your points, and allowing your learner to explore and fail in a safe environment, while setting them up to succeed, even if they miss on the first try. And when they succeed, I congratulate them and award them a badge for preventing a disaster (a little touch of gamification). Once they explore all three scenarios, and earn all three badges, then and only then, a button appears inviting them to move ahead with (or perhaps complete) the course. Isn’t that a lot more interesting than rigidly controlling the navigation and forcing your learner to proceed 1-2-3-4-5 in lockstep? 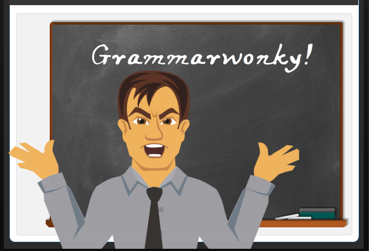 This way, you’re still subtly controlling the environment and the learner’s experience. You’re still ensuring they cover all the material. But you’re giving the learner a stake in the game, allowing them to make choices, engage with your content, and come out as heroes. Sure, creating a course with branching takes a bit more work to design and build. But the end result will be a course that your learners might actually enjoy and remember! To view the sample template in action, click the image at the top of this post. 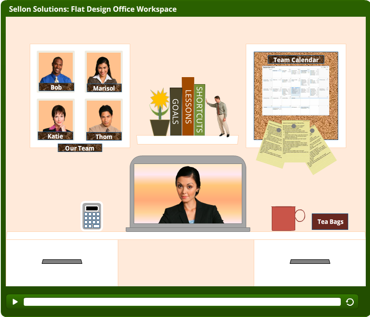 This week’s eLearning Heroes Challenge on the Articulate Forums was about creating custom icons for your eLearning courseware. It’s a great project; after all, you want icons that have the appropriate look and feel for your unique course, and even with all the great free resources available on the internet, there might come a time when you can’t find an icon set that’s just right. And of course, we’re not all artists. So if the thought of creating a custom set of icons sounds daunting to you, let me show you how quick and easy it is using only PowerPoint. We were encouraged to use PowerPoint for this challenge, for maximum shareability of our finished icon sets. Just insert a shape on a PowerPoint slide. Then format it to your liking using the Quick Styles feature and the Format Shape options on the right-click menu. And if you’ve never explored the various Wingdings sets that come with PowerPoint, this is a great time to do it–there are all sorts of handy characters (telephones, printers, arrows, and much more) in there, just waiting for you to find them. TIP: Don’t settle for just picking a Wingding set and typing a character on your keyboard. You can also hold down the Shift key as you press your keyboard keys to get a whole second level of Wingdings in each character set! How do you define scripting, storyboarding, and prototyping? Scripting: I define “scripting” as the proposed wording of the voiceover script that will be used, slide by slide. Some people include the onscreen text in this definition. As long as you’re clear and consistent with your clients, so that everyone is on the same page, either can work. But coming from a performing arts background, for me the script is what is said. Storyboarding: This is another term that comes from the performing arts, specifically the movies. Filmmakers typically have a visual shot-by-shot “storyboard” based on the written script, including visual mockups (even just stick figures) making it clear what the visual (and emotional) event is for each frame: an explosion, a look of surprise, a handshake, a close-up of an eye with a tear rolling down, etc. The storyboard is the blueprint for what the cinematographer and his or her camera crew will be looking to replicate faithfully on film. 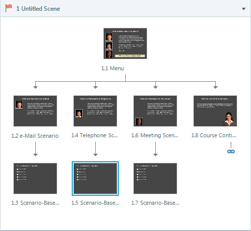 The same is true for eLearning: the storyboard represents slide by slide (or frame by frame) what the learner will encounter in the finished course–including onscreen text, visual/media elements, notation of any actions/interactions, and the voiceover script. Prototyping: Even if you create a highly visual storyboard, it’s still only a static blueprint of what you (or your developer) will be building in your eLearning development tool. Before you develop a whole course, always develop a working prototype–a few sample slides (say 2-5) from your storyboard that give your client a “feel” for what the learning experience will be like hands-on for their target audience. It should include draft onscreen text, image(s), and a sample interaction and/or quiz question that you plan to use. If time allows, and the client doesn’t know your work, scratch audio can be helpful, too. But for a quick prototype, it’s mainly about the look and feel. I view these three elements as complimentary components of a whole, so to me it’s not an either/or situation. I use them all, and recommend that you do the same. Do you use different types of storyboards? When do you use each? I try to keep my process as simple and client-friendly as possible, so I use the template that best suits the project. For soft skills training (ex: compliance, orientation, policy, etc.) I typically use PowerPoint, because every client is comfortable with it. I put the text and images on the slide, with an appropriate marker for any proposed interactive element. 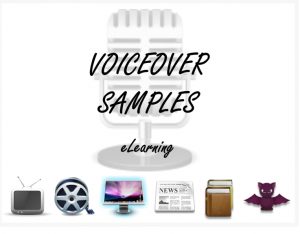 In the Notes section, I put the voiceover script for that slide, and in a separate bracketed paragraph, any developer notes–for instance, explanation of how an interaction will play out, how onscreen elements will appear or disappear, and align with the voiceover script. Clients can add their comments, and then once we have finalized the storyboard document, I strip out the bracketed developer notes. An alternative I sometimes use if time is tight: I storyboard right in my developer tool, then use the Word export to create a very basic storyboard document that the client can mark up. The drawback to this approach currently is that while the client can mark up the voiceover script, they cannot edit the text on the slide in the Word document, because it’s just a static image. For simulations, I have created a separate (but still simple) MSWord template with columns for Audio File Name, Process Step #, Voiceover script, Action, and Comments. This serves as my “shooting script” when I capture the step-by-step screens needed for the simulation, and ensures that I’m not missing a step or interaction. Since there aren’t any visuals to use for a simulation storyboard until I record the screen captures, I will typically capture just one screen and mark it up with sample text, highlights, arrow, etc. as a style guide, so that the client understands what the look and feel of the whole simulation will be before I do the full set of captures. I’m including a screenshot sample of both kinds of storyboard templates with this post. Tip: I always record my audio separately, in a standalone audio tool (Audacity, Audition, etc.) rather than in the developer tool. How do you storyboard interactivity? 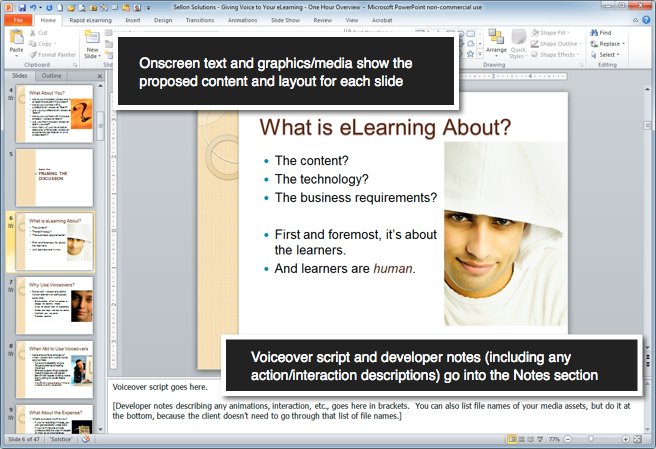 When I have a slide with an interaction, I will typically draft the basic proposed interaction in my developer tool (for example, Articulate Storyline), and then I will do one of two things: (a) paste static screenshots onto slides in my storyboard, or (b) create an Mp4 clip of the full interaction, so that they can understand and evaluate the look and feel of the interaction. I use SnagIt for the Mp4 mini-movies, as Storyline currently doesn’t output to Mp4–something that hope will be in the next version! As I noted above, I typically include one sample interaction in my prototype, so that the client can interact with it hands-on and decide if that approach suits their target audience. Once the client is happy with the overall proposed look and feel of how interactions will be presented in the course, then a single screenshot of the interaction, along with a description in the Notes section, will usually suffice after that. What are your top three storyboard tips for new course creators? Keep your documentation simple and clear. Why use three documents when one will do? Why force your client to wade through endless lists of graphics asset file names, over-compartmentalized layouts, or complex developer instructions? Include information as needed, but put the tech stuff at the bottom so the client can easily skip it. Keep your client focused on the course’s impact, not on what’s happening behind the scenes. 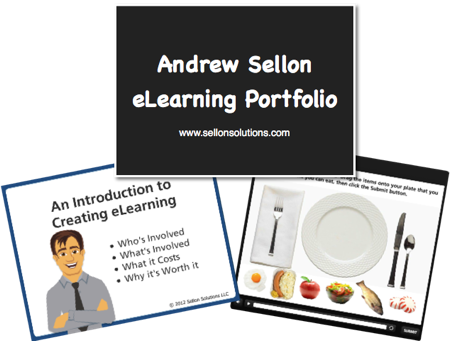 Visuals are crucial in eLearning. Wherever possible, use the actual proposed images/media to make sure that your storyboard accurately reflects what the target audience will see. Coming up with images that speak to the client is often one of the biggest challenges in storyboarding. Using a template that only includes image placeholders would be a waste of everyone’s time. Make sure that your storyboard’s imagery and word choice (both onscreen and in the voiceover script) are genuinely engaging and compelling. 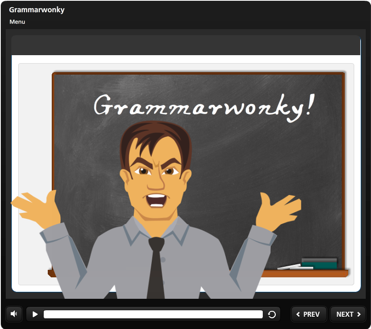 Great eLearning starts with a strong script and images that resonate with the target audience. The animations and interactions you might add are icing. By the time your client finishes reviewing your storyboard draft, they should have a clear sense of the emotional journey you have created for their target audience. Thanks for another terrific challenge, David! Now, I’m going to pose a challenge to Articulate in return. I have submitted this as a feature request, and think it would be enormously helpful to all Articulate Storyline users and their clients: Add a Developer Notes tab to the development stage (the content on this tab would never output in the published course), and adapt your Word export feature so that it outputs both the Notes (voiceover script) and any Developer Notes in their own cells below the slide image. Finding a way to make the output images editable in the Word document would be a real bonus, too! Then the Word export feature would become an even better storyboarding tool, saving a lot of people time and money. Folks: If you find my thoughts on this topic useful, I encourage you to leave a comment on this post. And consider subscribing to my newsletter using the form on the right side of this site. It’s free. It’s quarterly. And there’s no spamming involved. Ever.